Scan10623, originally uploaded by bucklesw1. Graveside services for Ruby Haag Brown age 96 will be held , Tuesday August 26th at 1:00 PM at Brownstown Fairview Cemetery in Indiana. Ms Brown was the daughter of the late Charles William Fisher and Ruth Eleanor Gregory. She was a native of Brownstown, Indiana and traveled with the circus for 50 years, lived 20 years in Donna, Texas and spent her last 2 years in Dublin, Georgia with family. She enjoyed the circus life and performed for many shows including: The Mighty Haag Shows, Ringling Bros and Barnum & Bailey, the Circus Hall of Fame and many Shrine Circuses. Her talents included aerial acts like the Loop Walk and Spanish Web. She was famous for for being carried in Alice the elephant's mouth by her leg. She will also be fondly remembered by her fans for "Miss Ruby's Dogs". She was a lifetime member of the Order Of The Eastern Star #29 in Royal Center, Indiana. Survivors include her son Harry Eugene Haag Jr., (Patricia) of Dublin, Georgia, 10 grandchildren and many great grandchildren and great-great grandchildren. She was preceded in death by her husbands, Fred Leo Brown of 43 years and Harry Eugene Haag Senior of 29 years; son Charles Ernest Haag; daughter Naomi Ruth Haag; sisters Josephine Silverlake and Sarah and Evelyn Fisher and brother Arthur Gregory Fisher. Took me a while to figure out who Charles Ernest was and of course it's Doc Haag. Hi Buckles, This is Darren Bryan. I hope you are doing well. I thought you may want to know about Harry Haag Jr.
Harry Eugene Haag, Jr., 87, of Dublin, GA, died Tuesday, November 21, 2017 surrounded by his family at the Hospice House at Carl Vinson VA Medical Center after a long battle with cancer. He was born on May 18, 1931 in Royal Center, Indiana to the late Harry Eugene Haag, Sr. and the late Ruby Fisher Haag Brown. He was born into a fairytale life of circus entertaining. His grandfather was the famed Ernest Haag, creator of the Mighty Haag Shows who toured America for over 40 years from 1891 to 1938. 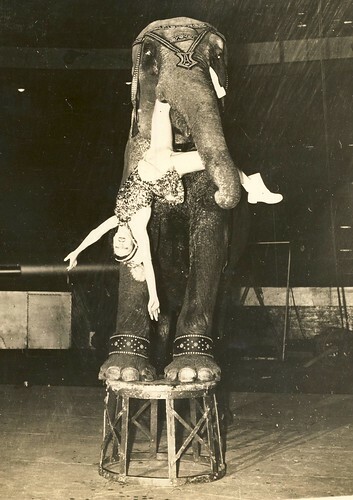 His father, Harry became the show's general manager and the elephant trainer and his mother, Ruby was one of its star aerialists, performing the Loop Walk and Spanish Web, Miss Ruby's Dogs, and was best known for being carried in the mouth of her most trusted elephant, Alice. Harry Jr. had a special talent with animals and trained elephants, lions, tigers, zebras, camels, llamas, horses, and dogs. He trained lions and tigers at The Jungle World Compound for Melvin Koontz, worked Roy Rogers Liberty Horses, travelled to Cuba with Tom Packs Circus, worked with Mable Stark training big cats, travelled with Al G. Miller Brothers Circus, Fisher Brothers Circus, Lewis Brothers Circus, and many Shrine Circuses. He performed a Liberty Horse Act with Ringling Brothers Circus at Madison Square Gardens, NY. He appeared on the Ed Sullivan Show, and in minor roles training animals in movies Merry Andrew and The Greatest Show on Earth. He also did a command performance of Jack Joyce's Liberty Horses for the Kennedy's (Jacqueline, Caroline, and John) at the Ice House in Washington, D.C. He not only spent most of his early life serving as a circus entertainer, but also served his country in the Seventh Infantry Division of the U.S. Army, facing combat in Korea and earning a Bronze Star. General L.L. Lemnitzer commented, "Harry had successfully met every test and challenge presented by the terrain, the elements, and the enemy. You have successfully taken every objective assigned to you. You have done these things with skill, determination, and indomitable courage." He was preceded in death by his father, Harry Eugene Haag, Sr., mother, Ruby Fisher Haag Brown, his brother, Charles Ernest (Doc) Haag, and sister, Naomi Ruth Haag. He is survived by his wife of 53 years, Patricia Eagon Haag of Dublin; daughters, Rocky Nielsen of Phoenix City, AL, Kim Gay of Dublin, Ruby (Darren) Bryan of Dublin, Alice (Larry) Dees of Dublin; and only son, Harry Eugene Haag Jr. (Jeannie) of Rentz. He has 11 grandchildren: Luke Jachimowicz, Christopher Nielsen, Kallie Townsend, Kasey Gay, Caleb Gay, Parker Bryan, Kathryn Bryan, Kaitlyn Bryan, Emma Dees, Harry Eugene Haag Jr., Graysen Haag and 5 great grandchildren. Funeral services with military honors will be conducted at Georgia Veterans Memorial Cemetery in Milledgeville, GA on Wednesday, November 29, 2017 at 1:00 p.m. with Pastor Jim Fennell officiating. In lieu of flowers, please consider making a donation of a wreath to be placed on the grave of a Veteran for Christmas at: www.wreathsacrossamerica.org.